“I have been working on my greenhouse since the beginning of August and it is nearly done. I have to share with you pictures I took of it because it is through the knowledge I acquired mainly from your book. I used some of Norm Abram’s (of The New Yankee Workshop) construction ideas and adapted them to my own design. 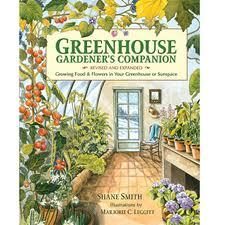 I weighed heavily the design considerations for a functioning green house set forth in your book. The location of my greenhouse is north central Massachusetts. My intention is to use it all winter (brr…). It is a 10 ft x 12 ft structure. I plan to incorporate the solar greenhouse philosophy because I haven’t got electricity in it yet. The materials used for the framing is 2 x 4 Mahogany. It sits upon cement block that are three feet in depth at it’s deepest point. The foundation has a footing that is 12 in x 12 in. All was manufactured from the 2 x 4′s, including the door. I don’t have solar window openers as of yet for the 10 windows but are coming.